If you've never done yoga, it looks intimidating. 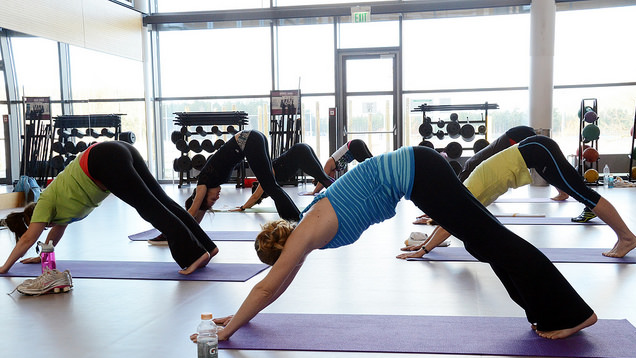 People are flexible, fit, trendily dressed — wait, I might be thinking of gym ads rather than actual yoga classes. It turns out you can have a great experience at a yoga class even when you're brand new and we asked yoga instructors how. You don't need to be great at yoga to start trying to do yoga. Makes sense when you say it like that, right? There will be a learning curve and that's OK.
An easy way to know what you're getting into is to check out yoga videos online. There are some great yoga sessions on our list of the best YouTube workout channels, for example. It's raining. The gym is crowded. Might as well stay home and watch videos...workout videos. Here are some of our favourite ways to get fit with YouTube. Namaste is a greeting that instructors will often use at the beginning and end of class. It means "I bow to you" but you can also translate it poetically as something like "the divine light in me recognises the divine light in you." My kid watches yoga videos that just describe Namaste as the "secret yoga code word." Close enough. Downward dog and child's pose are good poses (sorry, asanas) to know. They're super common — you might do dozens of both in a single class — but they're also meant to be resting poses. If everybody is doing some challenging pose and you can't hang, just do one of these instead. Your instructor will understand. Sun salutation is a sequence of poses that flow into one another. Here's one version that you can practice at home. It's fine to just do this sequence a few times, pausing in each pose while you take a few deep breaths, and call that your yoga workout for the day. In a class, there's a good chance you'll see sun salutations, or something very much like them, as a warmup or in between other poses. Several of the yoga instructors we talked to suggested trying videos at home first, but one, Chris Lucas, points out that you can hurt yourself if you don't know what you're doing. He runs a video coaching service, so he would say that, but it's a good point: if anything hurts or feels wrong, stop. You can ask an instructor about it when you see one in person. 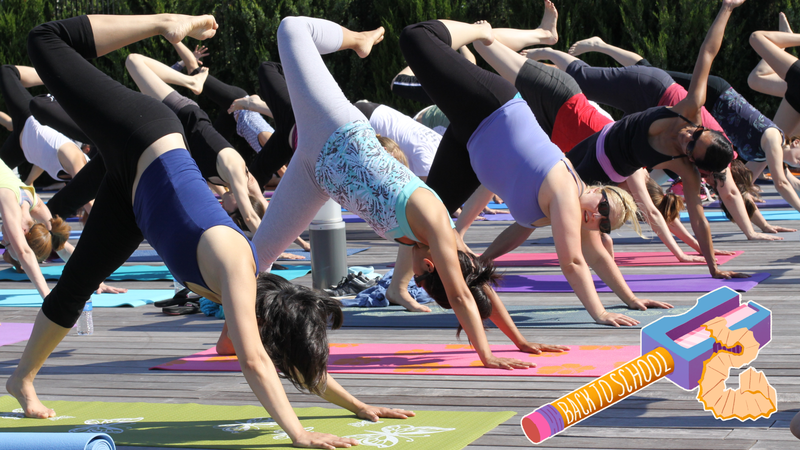 Yoga classes are everywhere: yoga studios, of course, but gyms also hold yoga classes and it's not hard to find community events like a "yoga in the park" day. But if you want the most welcoming experience, take the time to do your homework rather than tagging along with whatever your yoga expert friend wants to do. You don't have to be flexible to do yoga, although it certainly helps for some poses. But there are plenty of moves you can do even if you have the world's tightest hamstrings. That's because even if classes say they're for all levels, or no experience necessary, that doesn't mean they're beginner friendly. (Some are, but it depends.) I went to an "all levels" yoga class at a brewery once, thinking we'd do some half-assed yoga and then all go get a beer, but the instructor quickly talked us through a 75-minute flow of moves that she only described with their Sanskrit names. By the end I really felt like I deserved that beer. But if I hadn't been practising yoga for years, I would have been lost. Call up the yoga studio (or email the instructor) and ask whether they'd recommend their class for a total beginner. If you're still feeling nervous, and have a few bucks to spare, ask about a private session. With one-on-one coaching, you can ask all the embarrassing questions you want, and you'll leave with a better understanding of what you should actually be doing when you come to class. Jodi Gonzales of ArtYogaWellness suggests looking for a Hatha yoga class; these tend to be gentle and beginner-friendly. She also points out that hospitals and clinics sometimes offer "adaptive" yoga that is good for people with disabilities or health concerns. If you do have yoga-practising friends, ask where they go and what they like about their studio or instructor. This isn't really to suss out the level, but more to get the vibe of the place. Some instructors are very serious and others are more laid-back. Some like to walk around the room and reposition your body if you're not quite getting the right posture; others will stay on their mat and leave you alone. If you don't have a friend to give insider info, it's fine to ask the instructor these questions, too. You don't have to dress in all spandex, but you'll want to be comfortable. Regular workout clothes are fine. If you wear a loose-fitting t-shirt, it may fall down around your shoulders when you do downward dog. Just be aware of that. Don't worry about shoes; you'll take them off as soon as you get to the studio. Take one look at someone in Scorpion Pose and you'll know. yoga can build strength and balance. But how does it stack up to traditional strength training — and what can't yoga do for your body? Since you're there early, you'll have time to introduce yourself to the instructor. Explain that you're totally new to this, and let them know if you have any questions or concerns or if you have a nagging injury that you need to work around. 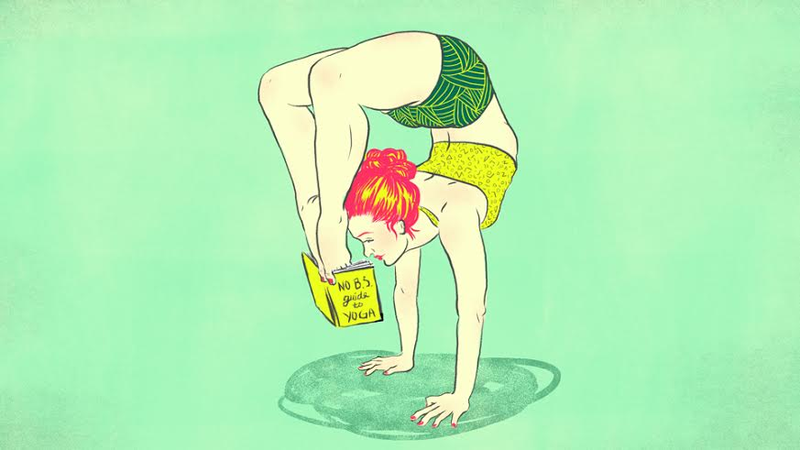 Yoga teachers' brains tend to be encyclopedias of pose modifications ("sure, if your wrist hurts in downward dog you could do this or this or this...") and they're happy to share. I also just like explaining any issues to the teacher so that if they see me taking extra breaks, they know why. Once you've done that, set up your mat in a good spot. If you're in the back, you can look at other students any time you feel lost. But since you might end up turning to face the back of the room at times, the middle might be a better bet. When you look at your yoga instructor (or that super-talented person in the front row), you may realise your pose doesn't look quite the same as theirs. But you don't want to imitate others exactly. In fact, doing so can be detrimental to you. Ask if you need any accessories for the day's class, like a strap or a block. Gather them by your mat. Then, just sit there until class starts. Or use the bathroom. For extra credit, sit up tall and practice deep breathing. You'll start in a seated pose (there are fancy ways to sit, but plain old criss cross applesauce is fine). The teacher may say "Namaste" and bow to you; say it and bow right back. The teacher may ask you to "set an intention". That just means take a second to think about what you hope to get out of the class. Nobody will ask what your intention is, but here's a good beginner one anyway: Silently tell yourself "I want to have fun and maybe learn something." You'll do a bunch of poses, and maybe breathing exercises, or whatever the teacher has in mind. Most classes don't have a lot of raising your hand to ask questions, so instead, watch the instructor and other students to try to figure out what's going on. If you're feeling overwhelmed, just slip into a downward dog or a child's pose to give yourself a break. The last thing is often a relaxation done in savasana, or corpse pose. Basically, you lie down on the floor and chill out for a while. Don't be surprised if you're doing this for five minutes or more, maybe with some changes in position. The whole time, just listen to the instructor and don't worry about what anyone else is doing. "The person doing some crazy stretch/twist/whatever is just trying to reach the same kind of deep sensation [they] had in their early days," says Chris Lucas. Go at your own pace and work within your own capabilities. Once the class is done, thank the instructor, and look for a spray bottle to sanitize your mat if you borrowed it from the studio. If you liked the class, make plans to come back again! And if not, it's fine to go somewhere else next time, or to just enjoy doing sun salutations on your own in your living room. If you're challenging yourself a little and having fun, you're doing yoga right.